Every meal is special at Lia’s Mountain View but we go out of our way to make them enticing so you’ll dine with us often. Everything is home made from fresh ingredients, and we offer very tasty special prices that will make you a happy regular guest at our tables, patio, and bar. Lia’s Mountain View is the restaurant home of three generations of the Mirto Family. You’re invited join them for fresh pastas, home baked breads, savory sauces, local meats, veggies , prime seafood and fantastic desserts. Come to the Mountain View and share the true taste of Italy and home-made Italian food. If you want to throw a party, why should you have to cook? 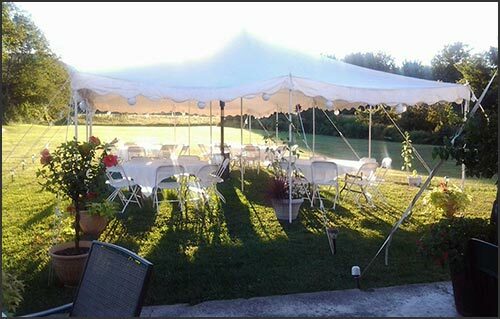 Either bring your party to Lia’s Mountain View and we’ll make your wedding, business party, or birthday absolutely fabulous. Or there’s our Take Out Party Packages. You can carry out the goodness of Lia’s Home Cooking wherever you choose. Come in and talk to us and let’s plan an event to remember. What is the true taste of home? What’s the recipe for happiness? Lia’s Mountain View Restaurant in Pine Plains, has the secret of both! Imagine the rich flavorful tastes of Italian home cooking that Giuseppe and Nina Mirto, founders of the Mountain View brought over from Italy, along with their family spirit of “A Tavola!” (Let’s Eat!) An invitation for family and friends to gather round the table and savor fresh pastas, home baked breads, local meats and poultry, home grown vegetables simmered to perfection or in crisp and juicy salads, rounded out by fantastic dolci (desserts). Every day, Giuseppe and Nina’s children and grandchildren greet you in the same spirit, welcome you with the aromas of home cooking, and treat you to classic and new Italian home recipes. Come to the Mountain View, you’ll find a true taste of Italy, brought to you by a family born to share good times with friends.